Unless you really want a fullblown PC sitting next to your TV, media centres are a touch overkill for most people. The problem is that TVs and computer monitors operate at vastly different resolutions, and if you've ever tried to output a PC's video signal to a TV set, you'll know how ghastly it looks. The alternative is to use your computer monitor, but who wants to watch TV on a 17in monitor if you've got a 28in TV? About the only good thing media centres have going for them is that they can be used as PVRs, but there are plenty of dedicated boxes, such as Telewest's TV drive, Sky and even Freeview options that do a far better job. Step forward the Pixel Magic HD MediaBox. 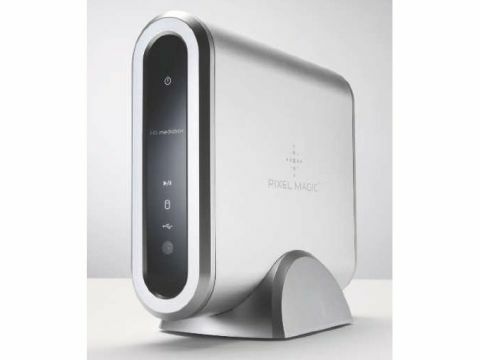 It's basically a media server that comes with a remote control and can output a video signal, as well as digital audio. It's not new concept, especially if you've seen anything like DivCo's TViX M300o- U, but it's certainly a very elegant one. One of the main advantages the HD MediaBox has over the TViX is that it's not just a media player; it's a NAS box and media streamer, too. The first impression you get when you pick up the HD MediaBox is one of ruggedness. When fitted with a hard drive - this is considered to be an optional component that you can add yourself - it's pretty weighty and thanks to the stand that holds it upright, you know it's not going to be easily knocked over. As the MediaBox has a 10/100 Ethernet port, you can use the device to playback media shared on your network, and other compatible NAS devices. However, the internal drive cannot be accessed by the network, so media loading needs to be via USB. This is rather disappointing, although the MediaBox has two USB ports to which you can connect memory sticks or external hard drives. Media cannot be copied from these, only streamed, but at least you can substantially increase the storage capacity. The HD MediaBox can output not just 720p and 1,080i, but 1,080p too, which is impressive because few HDTVs currently have the physical resolution to go above 720p. In order to feed your TV with these signals, the MediaBox is equipped with an HDMI connector for digital output and a VGA port for analogue. The VGA port can output both component HD/SD, or RGBHV for standard definition. he HD MediaBox is simplicity itself to use: connect it to your TV and use the remote to turn it on. We were a rather surprised at its sluggishness - it took 47 seconds from power on to reach the main menu, compared to just 16 seconds on the TViX M3000-U. However, part of that delay is the MediaBox waiting to receive an IP address. Once up and running though, it's easy to operate by using the direction arrows on the remote to navigate the directory structure. Incidentally, while the remote is backlight with a cool-blue glow, its layout is lacking, and could do with a rethink to bring it in line with conventional remotes. In terms of playback, the HD MediaBox is jack of all trades being able to handle all the major video and audio formats. For picture viewing, you can use JPG, BMP, GIF and PNG. There's certainly a lot to like about this media server and it beats many aspects of a media centre hands down.